The second video in the first series from Kal Koncepts/Air Syndicate. 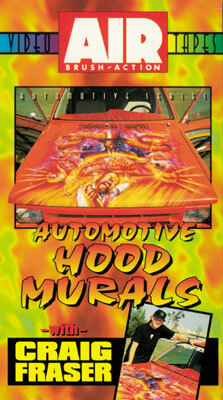 This video is the first complete hood mural video ever done, and still one of the only ones certified by an actual automotive paint manufacturer. The first 3 videos done by Kal Koncepts were sponsored by Iwata/Medea, PPG, 3M, and Airbrush Action Magazine. The theme on this minitruck was based on the Ray Bradbury novel, "Something Wicked This Way Comes". Check out how this mural is laid out, and freehand airbrushed by Craig Fraser. Done on the same truck that was used in the original graphic video, you can see how the mural is tied in together with the colors, and graphics on the rest of the truck.